The earliest settlement in Yarmouth was probably in the Fuller's Hill area. The Great Yarmouth deposit model shows a slight ridge running along the western edge of the Market Place, with the river line running along the line of Greyfriars Way. It is likely that the westward movement of the river bank was due to deliberate land reclamation, rather than due to natural river silting. Boreholes drilled as part of the Great Yarmouth Archaeological Map recovered worked timbers from the Town Hall Quay area. In addition, underpinning work inside the Town Hall in 1882 uncovered timbers recorded as "An old landing place or draw dock" (Anon, 1887). The worked timbers recovered by the Great Yarmouth Archaeological Map were dated by radiocarbon dating to 1250AD±30years. The wood was found in association with Aardenburg type pottery (dating to the 12th -14th centuries) and tile dating to the 13th - 15th century, suggesting that the timber was laid down some time in the late 13th/early 14th century (see the radiocarbon dating glossary entry for a some of the problems of dating wood). The recovered wood suggests that land was reclaimed by building a wooden quayside, then backfilling the space behind. This technique was common in Medieval England (e.g. Milne, 1981, 33). As the wooden quaysides decayed fairly rapidly, frequent replacements could lead to a gradual migration of the waterfront into the river, as appears to be the case in Great Yarmouth. Similar developments appear to have taken place in, amongst others, King's Lynn (Clarke and Carter, 1977) and Hull (Ayers, 1981, 126). Two twelfth century structures lie along the ridge of the early town: The Tolhouse was built in the late 12th century. Although it was built as a private residence, it was quickly taken over by the Borough, and became, throughout its life, a courthouse, a prison and a museum. 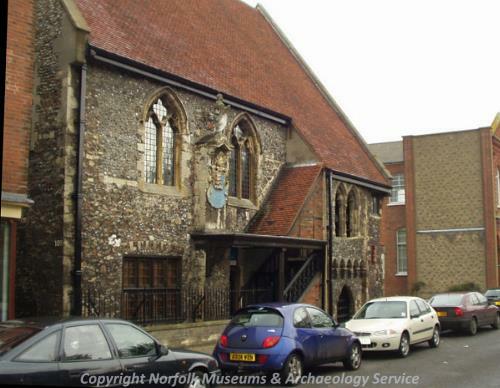 The Tolhouse was also badly damaged by bombing in the Second World War, and repaired to become the Tolhouse Museum. It is now the oldest civic building in use in England (Pevsner and Wilson, 1997, 503). The undercroft at 50-56 Howard Street was built in the 12th century (and enlarged in the 15th century). 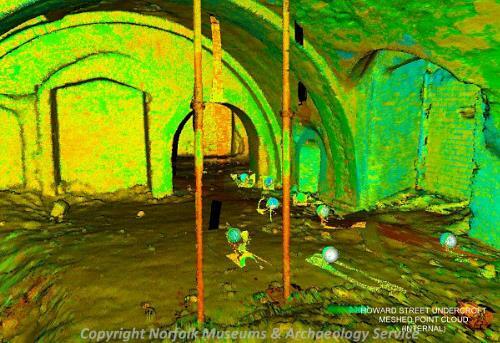 The undercroft was surveyed by 3D laser scanning, and a virtual tour of the cellars will be available here soon. Yarmouth went through a strong period of growth into the middle of the 14th century: in 1260, King Henry III granted Yarmouth a licence to build the Town Walls. The Walls were not started until 1289, and the last grant of murage was in 1390 (Ecclestone, 1959, 84). In the meantime, Yarmouth rose to become the 5th most prosperous town in England in 1334, with a population of around 10000 people*. This prosperity was partly due to Yarmouth's position at the mouth of the River Yare: it was ideally placed to act as a port for goods coming out of and going in to Norwich. Yarmouth had been granted a charter as a free borough in 1208, and so could raise revenue on all goods passing through the port (see Ecclestone, 1959, pp 164 for a fuller discussion of the conflicts between Gorleston and Yarmouth over mooring rights in the Haven). Studies of placename evidence suggest that The Rows were in place before the walls were built (Rutledge, 1990, 1999). For more information on Yarmouth's unusual street pattern, click here. *This figure is probably grossly overestimated. Yarmouth's pre-plague population was probably between 5000 and 6000. See Plague and Depression for more information.